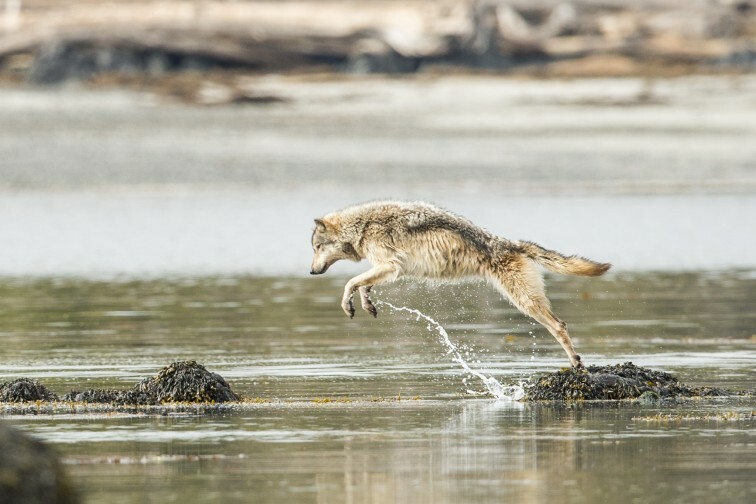 The coastal wolves have an extraordinary ability to swim across miles between islands. 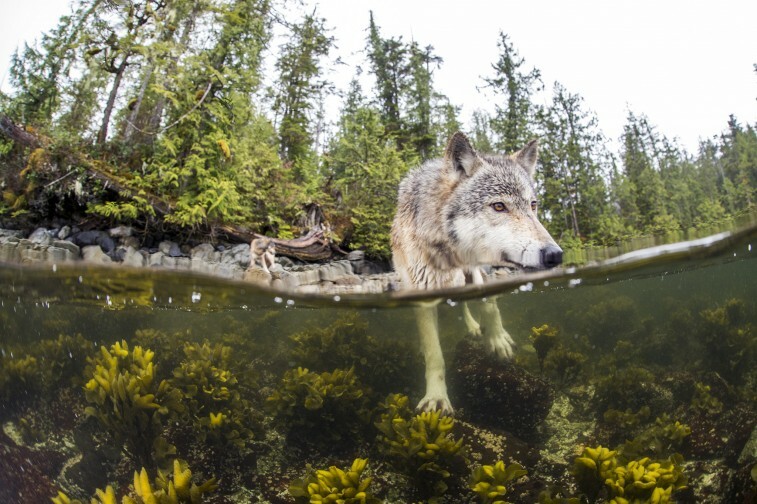 Sea wolves are a unique breed of wolf found in the Great Bear Rainforest along the Pacific Coast of Canada. 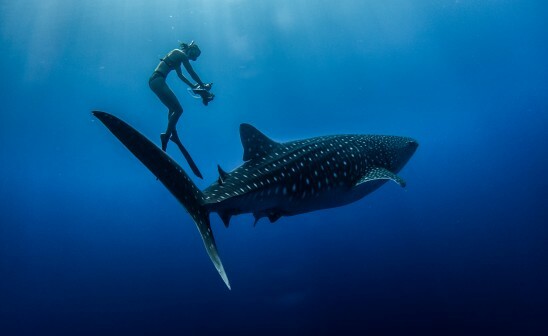 Swimming between islands like fish, they are genetically distinct from their inland cousins, or from wolves in any other part of the world. 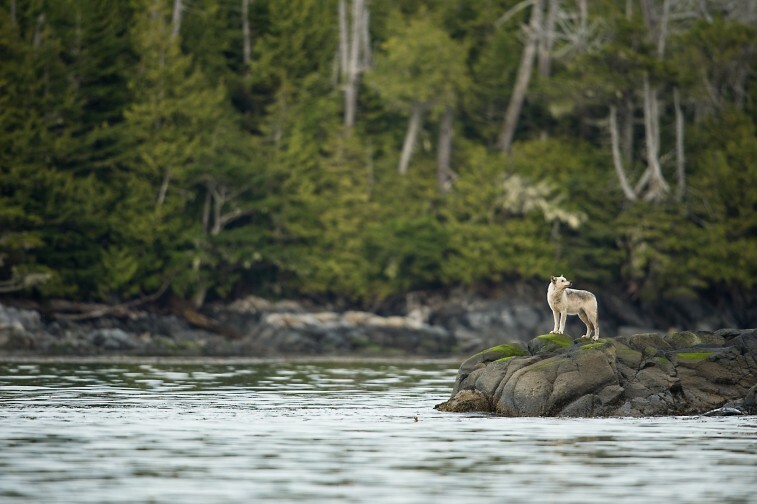 British Columbia has a relatively low human population where sea wolves enjoy an isolated wilderness - an area of 21-million acres, often described as a "bastion of biodiversity". There are 25 native species of conifers and grizzly bears, black bears and spirit bears living together. In the water, whales, sea lions, seals, seabirds and salmon make the sea extraordinarily richer than anywhere else along the coast. For thousands of years, wolves have lived in peace. 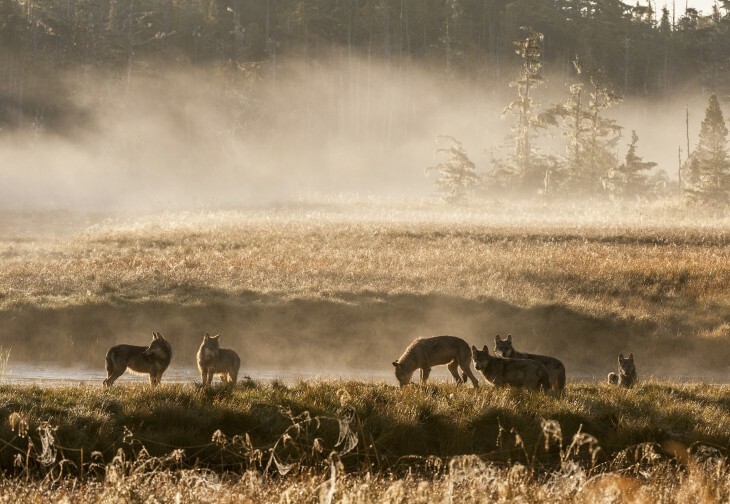 They had a unique relationship with the coastal First Nations peoples, for whom the wolf was considered as a revered animal treated with admiration and respect. However, they're being threatened on all sides by hunting, trapping and industry. 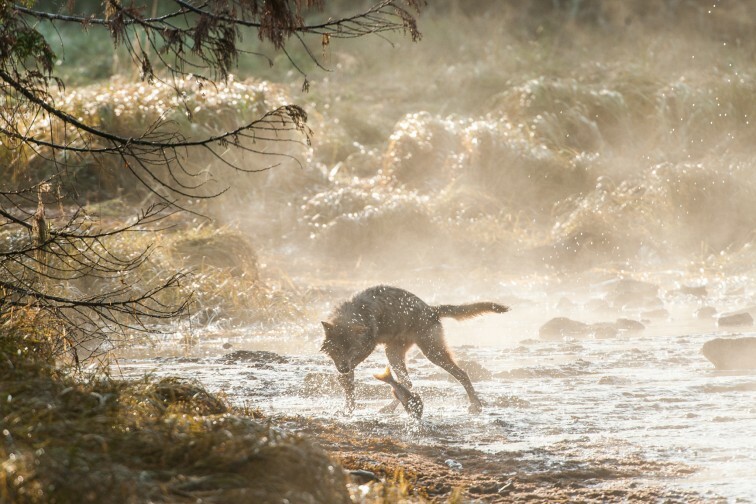 Road building and clear cut logging have appeared to be harmful to wolves, not only destroying the forests they live in but making it easier for hunters to gain access to coast wolves. The Northern Gateway Pipelines project is a new threat. Huge oil tankers will transport oil in this pristine region with the potential for devastating consequences. If an oil tanker ran aground, spilling its content or sinking, it will have long-term harmful impacts on the environment similar as the 1989 Exxon Valdez disaster in Alaska. 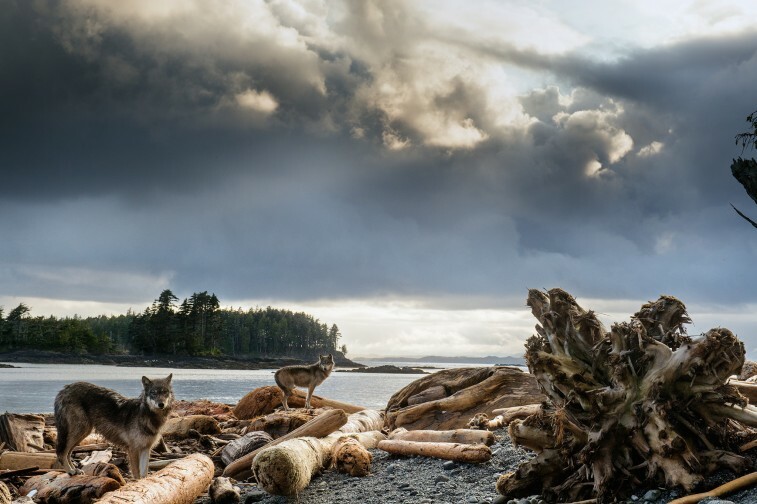 Chris Darimont from the Raincoast Conservation Foundation, developed the Rainforest Wolf Project in order to show these wolves as fragile symbols and gain scientific understanding about coastal wolves called "Canada's newest marine mammal". 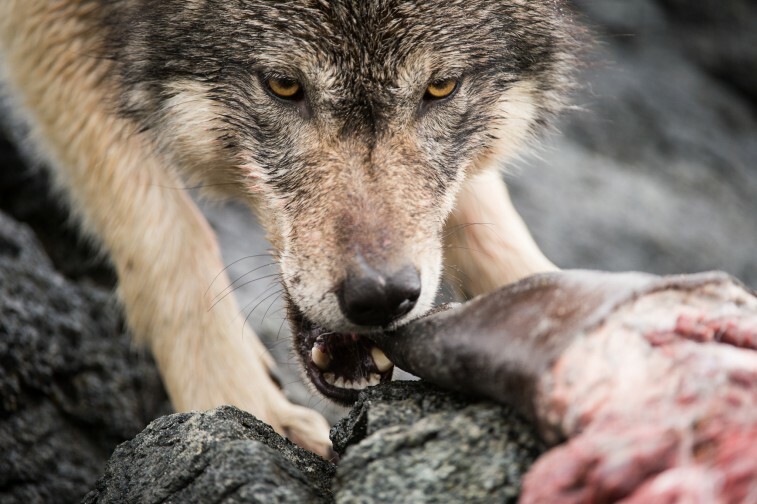 In the early 2000s, devoted nature photographer and conservationist Ian McAllister, and Canadian wolf biologist Paul Paquet started to conduct research about these coast mainland wolves eating salmon from the wild grey Pacific Ocean. They discovered a remarkable fact that locals already knew: 25 percent of the wolves' diet was made of fish. 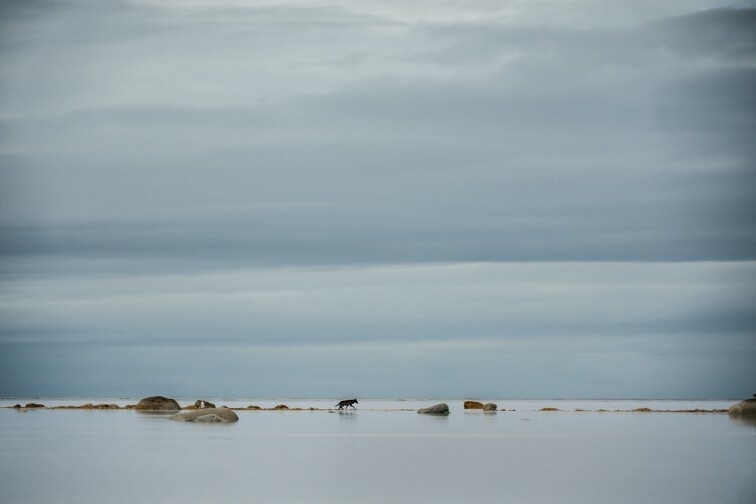 Most extraordinary is the coastal wolves' swimming ability, often swimming across miles between islands. 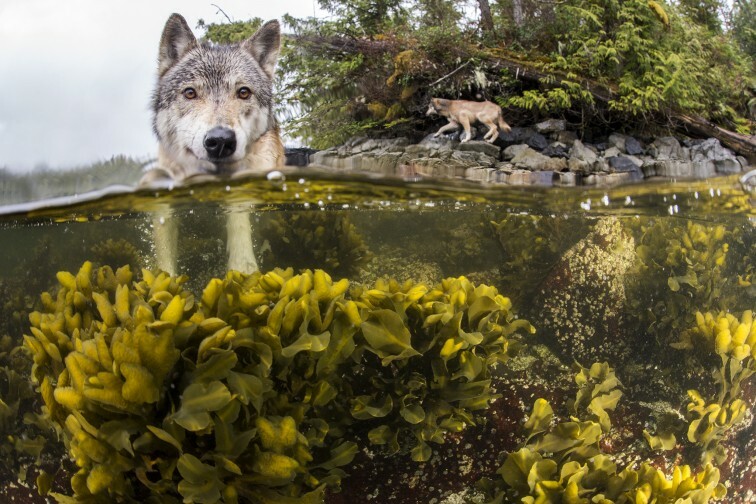 These photos are part of a magnificent series from a book entitled "The Sea Wolves, Living Wild in the Great Bear Rainforest", created by authors Ian Mc Allister and Nicholas Read. The book reveals the importance of preserving the Great Bear Rainforest for every unique creature that lives on the British Columbia's remote coast.